NEST Direct Plan funds, asset class and investment style. 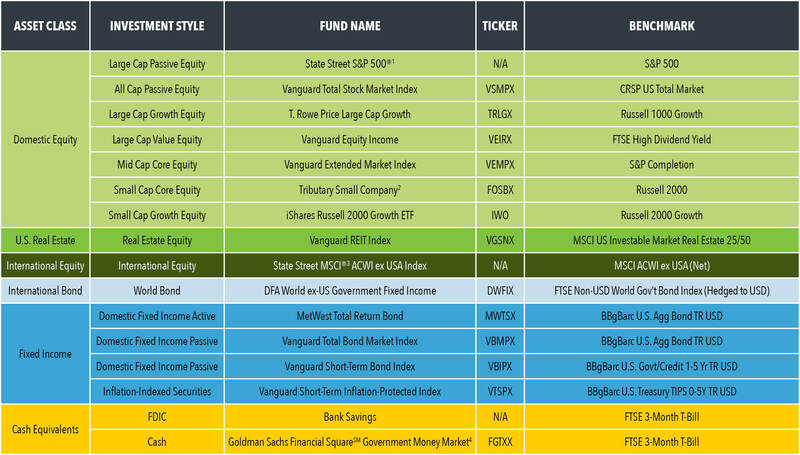 Not all funds listed below are in every Age-Based or Static portfolio's allocation. For the allocation to the underlying fund, please review each investment option. 2 The Tributary Funds is the mutual fund complex advised by Tributary Capital Management. Tributary Capital Management, LLC is a SEC registered investment advisor and is a wholly owned subsidiary of First National Bank of Omaha. 3 The MSCI ACWI ex USA Index is a trademark of MSCI Inc. State Street Bank and Trust Co.
4 You could lose money by investing in this Investment Option. Although the money market fund in which your investment option invests (the underlying fund) seeks to preserve the value at $1.00 per share, it cannot guarantee it will do so. An investment in this Investment Option is not insured or guaranteed by the Federal Deposit Insurance Corporation or any other government agency. The sponsor has no legal obligation to provide financial support to the underlying fund, and you should not expect that the sponsor will provide financial support to the underlying fund at any time.